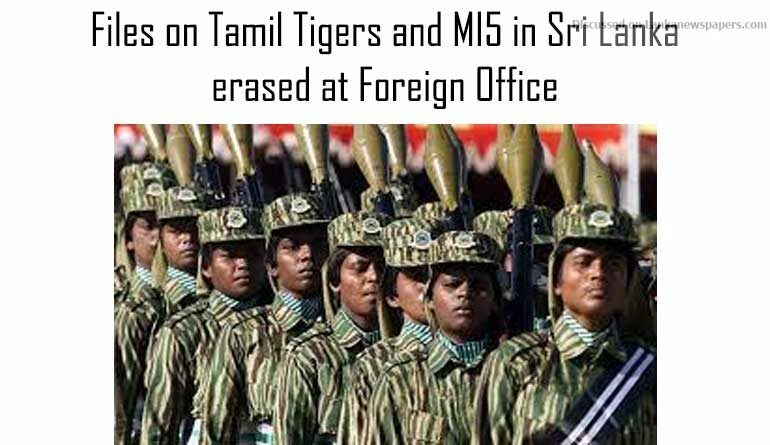 Britain’s Foreign Office destroyed almost 200 files on Sri Lanka dating from the start of a Tamil Tiger uprising during which MI5 and the SAS secretly advised the country’s security forces, it has emerged. The loss of the files means that there is almost no record of the British government’s work with the Sri Lankan authorities at the start of a famously brutal civil war. The destruction of the files raises fresh concerns about the Foreign Office’s attitude towards handling historic files on sensitive subjects. An official review in 2012 found that the department had destroyed thousands of documents detailing British counter-insurgency operations in Kenya and other colonies as the empire came to an end. Under the Public Records Act 1958 government departments are obliged to preserve historic records. But, in response to a Freedom of Information request from the Guardian asking for information about the destruction of the files, the Foreign Office stated that it was not required to preserve the documents. It said the files’ content “may be of a policy nature but might also be administrative or ephemeral”. The Foreign Office has now confirmed that it destroyed 195 files on Sri Lanka, dating from 1978 to 1980, three decades after the country became independent from Britain. The department would not say exactly when, where, or how the destruction occurred. Rachel Seoighe, a criminologist and Sri Lanka expert, at Middlesex University, said: “This discovery is very concerning given the lack of public information available about British involvement in Sri Lankan security practices at the beginning of the civil war.” She has filed a complaint with Unesco, the international body that protects world heritage. The Foreign Office kept a list of file titles, showing that the destroyed papers would have covered a range of important subjects, from security co-operation and arms sales, to foreign aid and “requests for political asylum in the UK”. The scale of destruction is such that only three files have survived from 1978, compared to 38 files from the previous year. The loss of these records is a blow for Tamil historians, who struggled to safeguard records throughout the Sri Lankan civil war. The famous Jaffna library was burnt down in 1981 by anti-Tamil groups, incinerating almost 100,000 documents including irreplaceable ancient texts. The Foreign Office claim that the information contained in the files was insignificant has caused dismay among Tamil experts. Varadakumar said: “It is improper for the UK government to deceive the public, who have the right to know. It appears that the Foreign Office’s action is designed to cover up the involvement of the SAS and MI5 in the training of Sri Lankan security forces that might be potentially embarrassing to her majesty’s government.”The Special Air Service visit to Sri Lanka is only mentioned in a handful of surviving files at the National Archives, which were preserved by the Ministry of Defence. Their contents have never been reported on before. One MoD file reveals that late in 1978 Sri Lanka’s right-wing president, Junius Richard Jayewardene, asked the Foreign Office for a British security expert to visit his country to help counter Tamil militants who were demanding an independent state of their own. However, a Foreign Office file called Sri Lanka: Security Assessment 1978, which could have shed light on the president’s request, was destroyed. From the surviving defence files, it emerges that an MI5 director, who held racist views, made two advisory visits to Sri Lanka in 1979, under both Jim Callaghan’s Labour government and Margaret Thatcher’s Conservative administration. The full facts of these visits are hard to establish because the Foreign Office destroyed a 1979 file named Sri Lanka: Defence Visits from UK. The MI5 officer was John Percival Morton CMG OBE, better known as Jack Morton, a former colonial police chief in India who had spied on the independence movement there and once wrote that Indians were “a sort of immature, backward and needy people whom it was the natural British function to govern and administer”. He later became a director at MI5 and held various security positions inside Whitehall. According to a defence file it was on Morton’s recommendation that an SAS team visited Sri Lanka in 1980 to train a new army commando unit. Among the files destroyed by the Foreign Office was one entitled UK military assistance to Sri Lanka, 1980. The SAS visit occurred weeks after Britain’s premier special forces regiment staged the Iranian embassy siege. For the next four months the SAS team secretly trained Sri Lankan army commandos, selecting 60 members to form an elite anti-terrorist force. A Foreign and Commonwealth Office spokesperson said: “The FCO, as with all government departments, reviews all its files in line with the requirements of the Public Records Act before making a decision on permanent preservation.